For courses in Ancient History (Ancient Near East— Egypt/Mesopotamia), Ancient Greece, Ancient Rome. This collection of primary sources focusing on the social and cultural history of the Ancient Near East, Greece, and Rome is designed to encourage students to examine issues pertaining to a broad range of themes through the analysis of relevant ancient literary and non-literary texts. Covering a wide variety of social and cultural concerns—ranging from marriage, family, war, and religion, to political culture, slavery, and entertainment—-the texts are arranged thematically within a general chronological framework to provide a broad overview of life in the Ancient World. 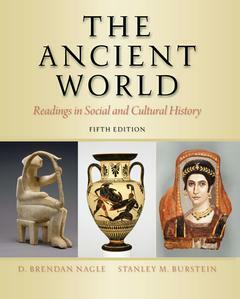 Note: This volume is the companion reader to D. Brendan Nagle's The Ancient World: A Social and Cultural History, 8/E, published by Pearson Education/Prentice Hall.